Twenty wonderfully varied stories chosen by competition, from 170 entries, by a panel of five independent and experienced judges. You’ll laugh, you’ll cry, you’ll empathise… and, who knows, you might even be inspired to launch into your very own adventure! 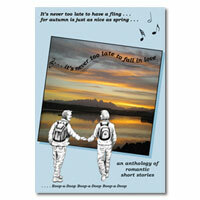 It’s Never Too Late to Fall in Love is an anthology of romantic short stories written by and about thirdagers. The stories were chosen by competition, from 170 entries, by a panel of five independent and experienced judges. The overwhelming impression is the huge and imaginative diversity in the stories. They vary from substantial works to the brief and witty; from moving and seriously observed, very personal, dialogues, to light and laugh-out-loud vignettes. Their themes and characters cover a wide range of situations, personalities and relationships but all, given that they were written by thirdagers, have their own ring of emotional truth. Some prove beyond a shadow of a doubt that learning in later life is beneficial and it’s always worth having the courage to try something new, or follow an escaped balloon . . . you never know where it will lead. Travel obviously works for some (one story is even set in outer space!) while for others bird watching, handwriting, cats, mud and the broken heel of a woman’s shoe may be all that’s needed. But it’s also gratifying that romance can flourish at home and especially when an opportunity presents itself to re-kindle an old flame. Readers may be interested to know that the sunset photo on the cover was taken by Adam Norton at 11 pm in January 2011 in Ushuaia, the most southerly city in the world.